Harissais a mountain village in Lebanon. The village, which is located 650 meters above sea level, is home to an important Lebanese pilgrimage site, Our Lady of Lebanon. Our Lady of Lebanon Sanctuary belongs to the Maronite Patriarchate who entrusted its administration to the Congregation of Lebanese Maronite Missionaries since its foundation in 1904. The shrine guardians constitute an apostolic missionary group, in accordance with constitution of the Congregation of Maronite Lebanese Missionaries. 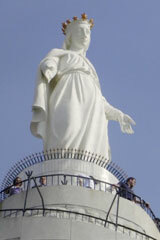 In 1907, the French-made, painted in white, 13-ton, bronze statue of the Virgin Mary, was erected on top of a hill, 650 meters above sea level, in the village of Harissa, It was made up of seven sections that were assembled on top of the stone base, which had a bottom perimeter of 64m, an upper perimeter of 12m and with an overall height of 20m. The height of the statue is 8.50m while its perimeter is 5.50m. The statue and the shrine were inaugurated in 1908, and since then it has been a major pilgrimage destination in Lebanon. Inside the statue's base there is a small chapel. A huge modernistic Maronite cathedral built of concrete and glass stands right beside the statue. 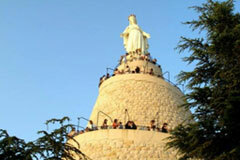 More than 60 Churches, schools, and shrines around the world are dedicated to Our Lady of Lebanon. Among other churches of various denominations, it is worth mentioning the Byzantine-style, Melkite Greek Catholic basilica of St. Paul, located south of the statue and built between 1948 and 1998. 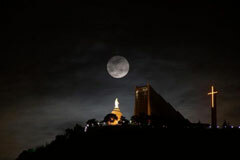 The Apostolic Nunciature (Papal Embassy), as well as the residences of four patriarchs of Eastern Catholic Churches, are in the vicinity of Harissa and Our Lady of Lebanon. On May 10, 1997, Pope John Paul II visited Harissa.